Online HPSSC Recruitment Applications are requested from qualified applicants for filling up the various posts in different departments of Himachal Pradesh Government. Online Recruitment Applications (ORA) can be filled up w.e.f. 23.12.2018 to 22.01.2019 till 11.59 p.m. (IST), thereafter link will be disabled. The detail of posts is as under in this article. 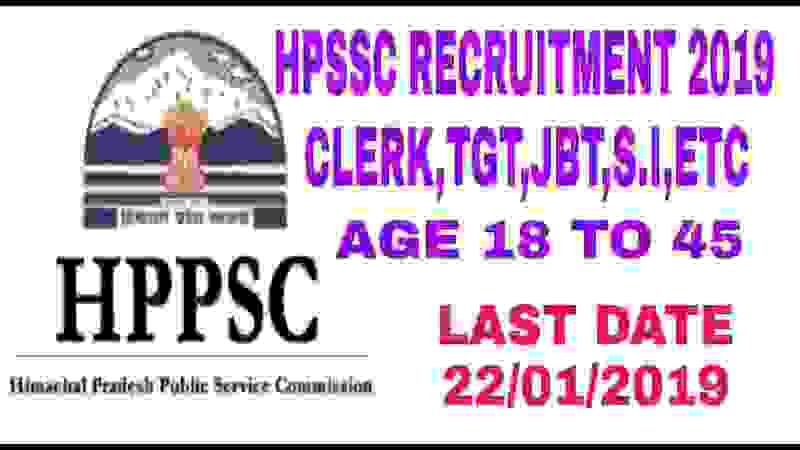 The official advertisement related to this HPSSC Recruitment 2019 has been published on the official website as well as on the “The Tribune Newspaper” published on 21st Dec. 2018. We took this information from these resources and shared with you readers. 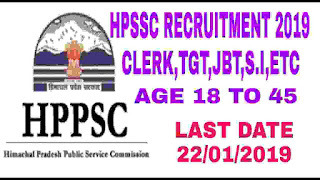 Read the full article carefully to know more about this HPSSC Recruitment 2019. B.A./B.Com With at least 45% marks and 1- year Bachelor in Education (B. Ed.) in accordance with NCTE (Recognition norms and Procedure ) regulations issued from time to time in this regard. Senior Secondary (or its equivalent) with at least 50 % marks and 4 year B.A. Ed. OR B.A./B.Com with at least 50% marks and 1- year Bachelor in Education (B. Ed.) Special Education. B.Sc. (Non-Medical) with at least 45% marks and 1 year Bachelor in Education (B. Ed.) in accordance with NCTE (Recognition norms and Procedure) regulations issued from time to time in this regard. Senior Secondary (or its equivalent) with at least 50 % marks and 4 years B.Sc. (NonMedical).Ed. OR B.Sc. (Non-Medical) with at least 50% marks and 1 year Bachelor in Education (B.Ed) (Special Education). Pay Band: Rs. 5910-20200+3000 GP per Month. i) 10+2 with 50% marks or Senior Secondary with 50% marks from a recognized Board of School Educaion and 2 years Junior Basic (JBT) Teacher‟s course/Diploma in Elementary Education(D.EI.Ed.) from an Institute affiliated to HP Board of School Education(HPBOSE). Senior Secondary (or its equivalent) with at least 45 % marks and 2 years Junior Basic Teacher (JBT) / Diploma in Elementary Education (D.EI.Ed.) (by whatever name known),in accordance with the NCTE(Recognition Norms and Procedure )Regualtions,2002. Education: Full time Diploma in Civil Engineering from a recognized Institution / University with 55% marks. (or) Full time Diploma in Electrical Engineering from a recognized Institution / University with 55% marks. Pay Band: Rs.10300-34800+4600GP per Month. Education: Graduate pass can apply for these posts under this HPSSC Recruitment 2019. Pay Band: Rs. 5910-20200+1950GP per Month. i. 10+2 from a recognized Board of School Education/University. i 10+2 from a recognized Board of School Education/University. iii. Computer typing speed of 30 words per minute in English or 25 words per minute in Hindi. ii. Diploma in Information Technology (IT) from a recognized ITI/Institution. Pay Band: Rs. 10900-34800+4350GP per Month. Education: Full time MCA/MSc (IT)/MSc in any discipline with PGDCA from recognized university with 55% marks. AND Many Other Job profile.. Check the Official Advertisement link given under IMPORTANT LINK section at the last of this article. The candidate should enter his/her particulars i.e. Name, Father’s Name, Mother’s Name & Date of Birth as per his/her Matric Certificate and upload scanned photograph and scanned signature. The size of scanned photograph should be less than 50 kb and size of scanned signature should be less than 30kb. The candidates must ensure their eligibility in respect of category, experience, age and essential qualifications(s), etc. as mentioned against each post in the advertisement to avoid rejection at later stage. 23RD Dec. 2018 is the Opening Date to apply. 22nd Jan. 2019 is the Last Date to Apply.